TurnHere provides short clips of ‘local’ and ‘native’ culture. Think multiple videobloggers meets map mashup and mix. It feels part amateur video, with great post-production editing, but let’s you experience a local culture almost like you’re there. Check out Solano Ave in Albany, San Francisco, Chinatown SF, LA, or tour New York, it’s like the Travel Channel on demand. Some videos are ‘sponsored‘ so you can clearly see a business model emerging. It’ll get really interesting once folks can see easily access this content on mobile devices. You can hire TurnHere to create marketing videos for your company or neighborhood. 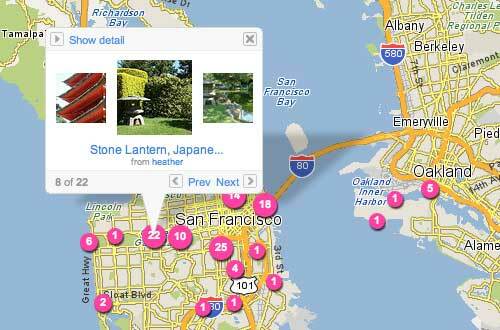 They don’t just do video, they’ll contribute content to these sites as too; Google Local, Google Earth, Google Video, CitySearch, Yahoo video, Yahoo Real Estate, MSN Video, Inside Bay Area. Why not video? because ‘video sells‘. I’m glad that we’re getting the right tools to watch video via the web –the platform of communication for the foreseeable future. Let users upload videos, and create response videos. Allow users to rate videos. Allow comments under each video. Provide code for video to be embedded in web sites. Enable Video uploaders to profit from high rated videos. Although no where near the quality of TurnHere, I’ve been experimenting with Online Video too, If you’re an online Marketer, you best start too.